Carbs are so my thing. No matter what Dr. Atkins says, I still think carbs are amazing. I love potatoes especially. So versatile, so delicious, it can be eaten with anything. Think mash potatoes and ribs, or baked potatoes with soup, or maybe fries with your burger, or cold potatoes with salad. The list goes on. Potatoes can be turned into any creative dish. I like a good potato gratin. Potatoes are satisfying – it fills you and gives you that ‘ahhhh’ feeling, if ya know what i mean. That said, allow me to rave about the above wedges for a while. Those are from Olio Dome. It has been a while since i’ve laid eyes on wedges. I do miss having wedges in Brisbane. 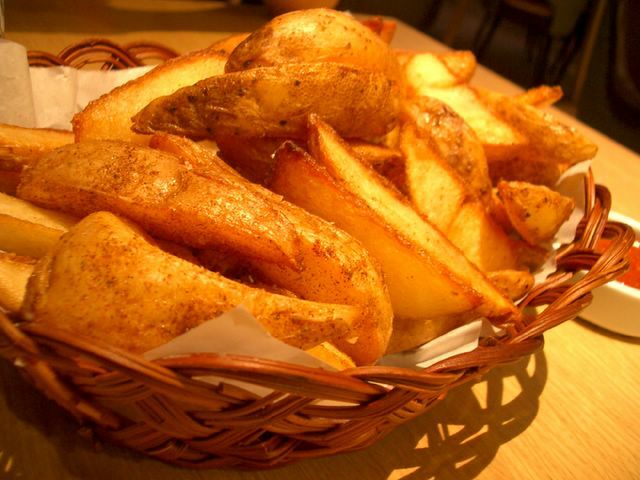 They’re so common there… even the fast food places have fries that are quite as thick or close to wedges. It’s like a staple there. And it’s not expensive as it is here. Anyway these chunky wedges i had were seasoned nicely and served with mayonnaise mixed with mustard and some tomato sauce (which tasted like pasta sauce, maybe they reused left over spaghetti sauce?). Potatoes are comfort foods. and these ones sure gave me lots of comfort.. they were served warm and it the golden brown hue makes you salivate. One portion is really enough for like 3 or 4 persons really. Can’t remember the cost, i think it was $5.90. Yes, what’s life without dessert. 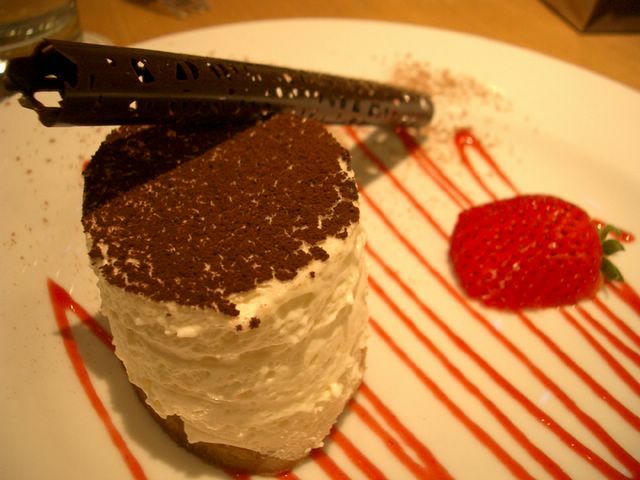 And what more, without Tiramisu? Tiramisu ranks as one of my all time favourite “Classic” must-have desserts… together with creme brulee of course. Hmm but I got to say Olio Dome’s tiramisu didn’t quite sit well with me. But i’ll give them top marks for presentation though. I sure did enjoy that roll of delicately crafted dark chocolate. A master-piece in itself. I usually prefer my Tiramisu with more cake than cream. And i like to be able to taste the liqueur. This one was mainly cream…. didn’t taste much mascarpone either. Was quite disappointed actually. Looks like i have to continue looking for the ultimate Tiramisu. Still have yet to find the best one. The one at Bakerzin isn’t too bad though. But I prefer their Chocolate Amer and Jivara more. Pure decadence. My mouth is watering at the mere thought of it. Great. Now i feel like having cake. Some good cake. Chocolate cake! okay i better stop before i hallucinate a cake in front ot me. I’m now thinking what to have for lunch…. Ahhh, those potato wedges look scrumptious! Oooo I love potatoes tooooo!!! Just had my dose of fries!